Pebbles urgently needs a new home as her owner is going to Japan to work. 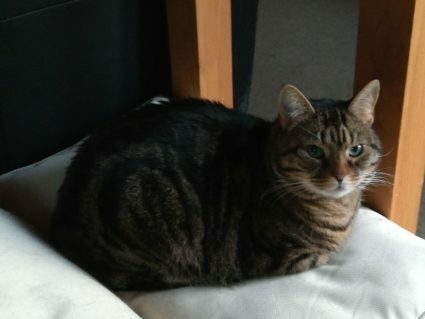 Pebbles is 3 years old, vaccinated, micro chipped and spayed. Her owner says “Pebbles is the sweetest, most social little being, she will throw herself on the floor craving the attention of anyone close. She is super cuddly and will come to anyone that gives her a little attention. She is primarily an indoor cat, she has always had the opportunity to go out, but she is a creature of “indoor comfort”. She might like to lie on a balcony or a terrace, but she is not the roaming type of cat. She is used to kids, I have a 2 year old and they grew up together, she does not use the claws, she walks away instead. She allows me to trim her claws, and even then she is just the most docile and sweet thing. She wanders 3 feet away and is then up for a cuddle – She is just THAT sweet. She comes with a supply of food, toys, a carrier, etc. She is a much-loved cat, so we are anxious to find the right home for her.